The instrument was originally built with both 57-note finger and 42-note barrel playing mechanisms, but the latter was removed at some time in the past. The organ stood for a number of years in St.Margaret and St.Mungo's Episcopal Church, Old Rutherglen Road, Glasgow, and was gifted to the University in 1973, after the closure of the church. 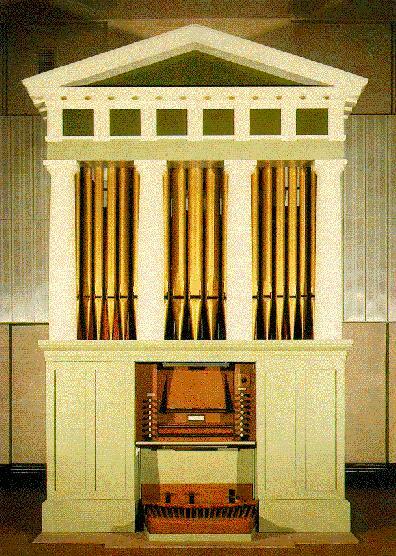 On at least three occasions in the past various additions had been made to the instrument, but in 1975, when the organ was re-erected in the Concert Hall, these additions were dispensed with, in an attempt to restore the original character of the instrument. The organ and its electric fan blowing unit are mounted on a movable platform.